As long as the search for large game fish goes on, top anglers will rely on the legendary strength and performance of the Penn International V Single Speed Lever Drag Reels. With the upgraded Single Speed, there are no special adjustments to make--simply throw the ratcheted drag lever into the strike position, set the hook, and reel like mad. Nothing could be easier, and nothing gives you a better chance of landing the fish of a lifetime. 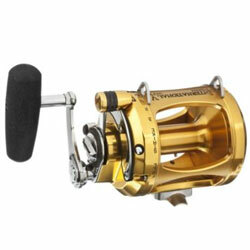 The gear ratio on these V Single Speed Lever Drag Reels equates to the higher gearing on the acclaimed Penn Two Speeds, to bring your fish boatside quickly, and in releasable condition. "i bought a penn internaional v 30 3 months ago its simply the best reel ever its not complicated and you can rely on it for every fish you hook. i own 2 penn international a v series and a II series u can realy see the diffrence between them."